Yeah. It is a pretty huge task given all the places we visited. When looked at as a whole, it was just too overwhelming. And. So. Well, the years have passed and nothing has happened in any significant sense with most of the images. Sadly the details are fading. I am determined to have a genuine attempt at it is this year. Though this year is already 3 months gone and I have only just started. I have a fresh approach. I am breaking this task up in to small sections, mini tasks if you like. I am going to select certain places and focus on this smaller task and then once happy with that, will move on to the next place. I was going to start with Paris. Of course. Of all the images we took, these are the ones I have visited more often than not over the years, however, I have decided to start in Italy. The Cinque Terre to be precise. It was one of the places on our 'must visit' list. We were not disappointed. Such a gorgeous little section of Italian coast line. From the unique and colourful villages (each with it's own personality) to the tiered vineyards perched precariously on the steep coast line. It was one very beautiful place. Stunning & definitely on my list of 'must visit' places. Oh my goodness, these are beautiful! I have always wanted to visit Cinque Terre - it's top of the List! Wow! I've been to Italy twice but never made it here. What a pain, will just have to go back again. Third time's a charm, right? The hard work will be worth it, especially with images as gorgeous as these. You'll have to share more as you work through them! the first is such a beautiful and amazing shot...it truly tells the story of a charming town. thanks for sharing these with us.. You know Italy is my favourite place and my one disappointment was not getting to Cinque Terre... it was 'on my list'.. but the friend I was travelling with wouldn't go.. Crazy yes??? 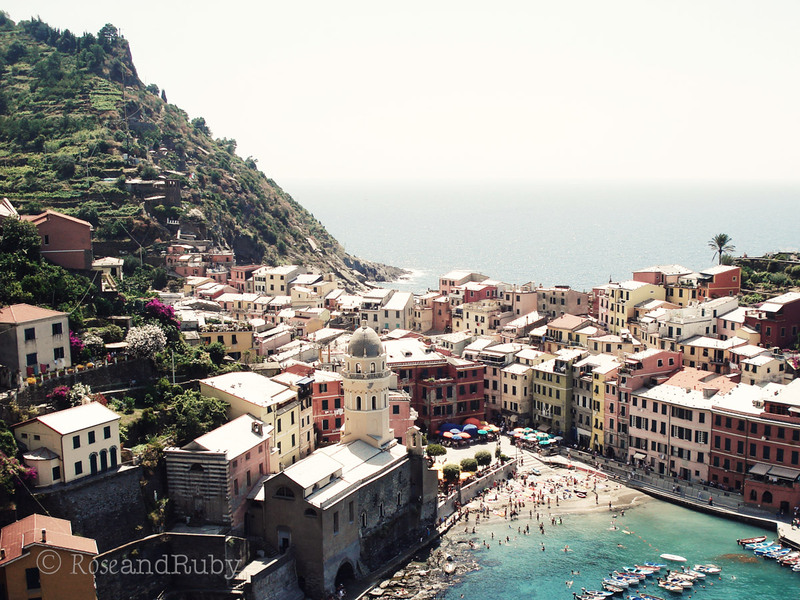 Now my yearning to see Cinque Terre is even greater.. such beautiful shots!!! fabulous!!! you are so talented!! Hi darling!! Cinque Terre definitely are one of the most romantic and special places ever..you can also eat a lot of delicious typical food! Have you ever been to Capri? Or to Positano and Amalfi? (They're in the Southern part of Italy!). You really should go! I guess you could take dreamy pics..
Beautiful shots, you have really captured the feel of this place. Has brought lots of fabulous memories flooding back for me. Gorgeous photos. I would love to be there right now!